Learn Photography For FREE! And Take Gorgeous Photos Today! We'll give you instant access to our library of photography training guides and tutorials. used these ebooks to learn photography. Get Confident. Transform Your Photography Today. Join more than 100,128 photographers just like you. And take better photos with our tutorials! 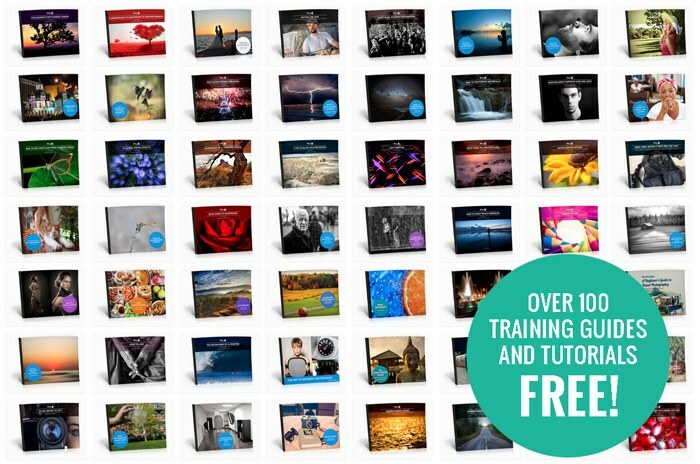 Instant Free Access to Our Digital Locker of 100+ Downloadable tutorials on Landscape, Post-Processing, Portraiture, Camera Skills, Low-light, Travel, Flash and much more. You'll be a confident photographer in no time! Up to 80% off on the very best premium photography courses & goodies! You won't waste $$$ on low-quality training courses. "What's the Catch – Why is it Free?" We offer a free photo education for everyone, because we LOVE to see our students like you, go on to produce amazing images! We hope that after you see how amazing our content is, you'll look at our premium training packages ...But, even if you don't, that's cool too. The free digital locker ebooks will still be yours forever, if you grab them today! "The content is great as an introduction and for more detail in some areas (such as Photoshop etc). The downloadable PDFs are also excellent – print them or keep them on your tablet device for quick reference out in the field. As an aspiring Pro it’s a fantastic resource with good articles and hopefully much more to come." Q.How is Photzy.com related to Light Stalking? A.Photzy is a sister site to Light Stalking. We started as a small side project in 2012 by the Light Stalking team. The goal was to provide more in-depth photography training, in the form of ebooks and video courses to Light Stalking’s readers. Since then, we have quickly grown into our own photography community now with over 100,000 members, providing a full library of photography tutorials via a digital locker. Essentially, we’re a very education-focused version of Light Stalking. Q.How different is Photzy from Light Stalking and other photography websites? A.The digital locker is what sets Photzy apart from any other photography website. The locker is a collection of over 100 pieces of content which members get for free. Unlike other photography blogs and training websites, Photzy’s content comes in the form of beautifully designed, easy-to-follow ebooks. Which can be downloaded and viewed on any device, at any time.